The Mayor and City Council recognize that some canals throughout the city have filled in to the extent that they are no longer navigable. Therefore, the City has initiated a canal dredging program. Each canal in Ocean City was surveyed and prioritized based on the average depth of the canal. A summary of these results is available here. 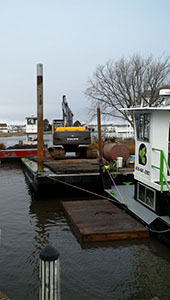 A multi-year Dredge Master Plan has been developed based on the Canal Priority and the goal of dredging canals in relatively close geographical proximity to each other in each year in order to maximize efficiency and keep costs down. Work began on the canals included in the plan in 2014. The master plan is available here. It is estimated that $500,000 per year will be needed to complete this initial plan. Please keep in mind that this plan is subject to change based on permit availability, the cost of dredging, funding availability and the condition of the shoreline along the canal. The Town of Ocean City will not initiate dredging work for any canal unless the complete canal shoreline is stable. This means that all bulkheads (or other shoreline protection structures) are in good condition and not leaking. Each property owner remains responsible for the condition of their shoreline. If your canal is on the master plan list, you should check the condition of your bulkhead or other shoreline structure and repair or replace if required. The Engineering Department is preparing a list of all bulkheads needing repair along canals planned for dredging and will send out repair notifications at least 3 months prior to scheduled dredging. The Town of Ocean City will pay for dredging the canal channel only. The City will NOT pay to dredge private boat slips (either parallel or perpendicular to the shoreline). However, the City did include these private boat slips in our permit documents. Prior to starting dredge work on any given canal, the city will notify each property owner and give them the opportunity to “piggy back” on our dredging contract and have their slip dredged at the owners expense based on the bid unit price per cubic yard. Owners will have to make payment up front and waive any liability for damage caused by dredging the slip.